The start of Spring was marked today by the JMM Girls Track & Field team kicking off the 2014 season by traveling to Dubuque, IA to compete in a 16 team invitational against WI and IA teams. The team was represented in both varsity and jv competitions finishing 7th in varsity with 34 points and 8th in jv with 15 points. The performance of the day goes to the girls in the 1500m run who finished 2nd, 3rd, & 6th overall scoring 17 points in one event. They were led by freshmen Delaney E (5:17.46), followed closely by senior Meghan S (5:17.56), and joined by fellow senior Amelia F (5:24.90). Delaney, Meghan, & Amelia also joined senior Siena C to run a Spartan Seven time of 10:18.43 in the 4x800 finishing 6th. Siena C came back later in the meet to finish 4th in the 3000m run with an 11:32.90. Additionally, scoring in the 3000 was freshman Lilly S (6th) running 11:58.68. The 4x200 team of Skyylah G, Emma Cate M, Mariah OF, & Sydney S combined to run a 1:54.55 to place 7th. In the field events senior Kayla G led the way in the pole vault matching a PR jump of 8' 3" to place 2nd and she was joined by teammate sophomore Sarah H in PRing with a jump of 6' 9" for 4th. Sydney S. placed 5th in the high jump with a jump of 4' 10" and 8th in the long jump with a leap of 14' 6.5". In the jv competition Margot W had a nice race of 8.19 for 4th in the 55m dash. Phibi M leaped 14' 2 for 3rd in the long jump and Emma Cate M went 14' 0.5" for 5th. Today's meet was a great starting point for the season. 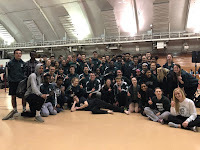 There are many hard workouts, hours at the track, and technique changes that will be completed in the coming weeks to ensure the team continues to improve. Strive to get better every day and this season will be a fun season for everyone on the team.